I don’t have a Blu-ray player but I want to play Blu-ray movie on my Smart TV. Is there an app that can let me stream Blu-rays from my computer for later playback on TV over DLNA? Build a situation of DLNA, you are able to stream media content between devices connected to the same home network, without having to store the content on both devices. Despite of various merits, DLNA doesn’t know how to play Blu-ray-like sources. So, if you want to play Blu-ray movies like Transformers 4 on Smart TV over DLNA to create a wireless home entertainment setup, it is sensible to learn how to stream Blu-ray to DLNA with a professional and fast Blu-ray ripper in the following part. How to Play Blu-ray Movies on Smart TV over DLNA? * Rip any Blu-rays and DVDs as high quality digital files like MP4, H.264, M4V, AVI, WMV, MOV, FLV, etc. * Do BD/DVD conversion quickly and stably on Windows XP/Vista/7/8/8.1/10. 1. Run the Blu-ray Ripper and click “BD/DVD disc” icon to load Blu-ray movies from BD drive. 2. 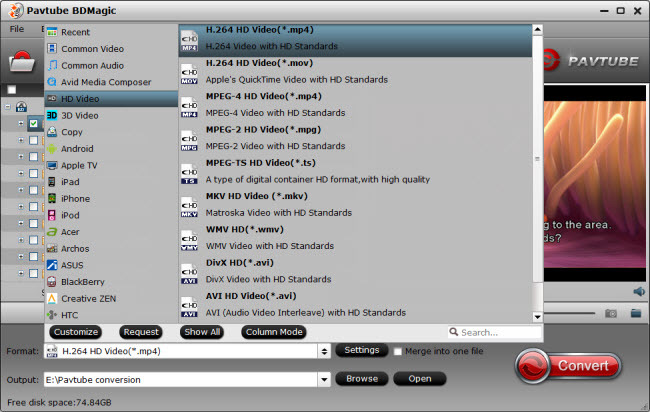 Click Format bar and choose a DLNA supported video format. MPEG-4, MPEG-2, WMV from “HD Video” are all the proper choice. Well, since you want to stream Blu-ray into Smart TV via DLNA, you can directly choose “H.264 HD Video(*.mp4)” or “MKV HD Video(*.mkv)” from “HD Video” as the output format. 3. Click the “Convert” button under the preview window, and the Blu-ray ripper will start the conversion from Blu-ray movies to DLNA/Smart TV both supported format. Once the conversion finished, click Open button to get the resulted videos and then you can stream the converted BD movies to Smart TV via DLNA. 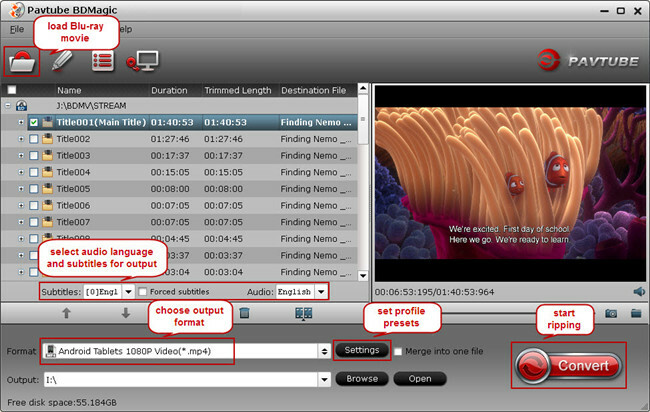 Access your video file and then playback the file to the connected PC (through an icon above your screen or Settings)Note: The name of the options in your PC might varies according to the version of Windows that you have installed. 1. Click Settings button to adjust video/audio parameters. As for DLNA streaming, select a proper bitrate and resolution based on your WLAN bandwidth. 2. How to play various SD/HD/4K Videos on Smart TV via DLNA? If you get some MKV, FLV, M4V, WMV, MOV, AVI, Tivo, XAVC, M2TS, H.265 etc. videos, and have trouble to play them on your Smart TV or other DLNA enabled devices, you’re in the right place. Similarly, we need to solve the problem is still compatible format. You can get Pavtube Video Converter Ultimate to transcode SD/HD Video files to DLNA/Smart TV friendly MP4 format with the fastest speed and best video/audio parameter settings. Free try this software and get Mother’s Day special deals 2015 with 20% OFF discount!